Designed to inspire you to work hard and play hard, this all new MVP fitness club features world-class personal training, expansive group fitness studios and open concept fitness floor, cutting edge programming, engaging Kid’s Stuff, platform tennis and an unrivaled outdoor recreation center sure to impress all ages. We offer the latest cardio, strength, resistance and functional training equipment. With hundreds of pieces to choose from, you’ll find everything you need to achieve the results you want! Offering over 100 COMPLIMENTARY classes each week, we provide you with classes to fit even the busiest schedule. We have what you need to get moving and get motivated! Train like a pro on our 40-yard functional and sports performance area with artificial turf, strength training, resistance and TRX suspension equipment. Need some motivation? Our team of highly credentialed, experienced and certified Fitness Trainers are ready to help you get the results you’ve been striving for. 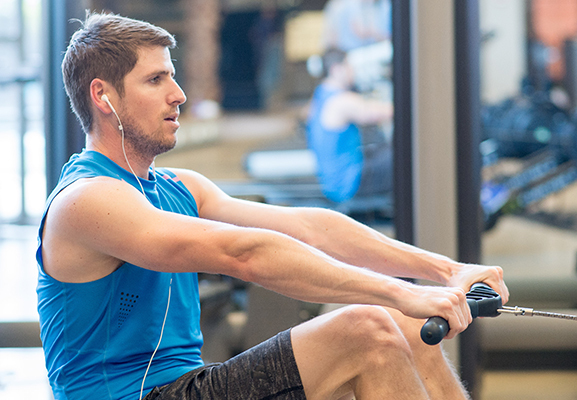 Members receive one (1) free GAME PLAN orientation session with a certified Fitness Trainer. Session is designed to fully engage you into the club and get you on a plan to a better you! Enjoy spa-quality locker rooms that include a sauna, free daily lockers with private rental and laundry options. Complimentary towel service is provided. Sorry parents, this amazing fun zone is just for kids! Kid’s Stuff is a supervised space for ages 0-11. Members can enjoy up to three (3) hours a day of care, while parents enjoy their workout. We have five (5) indoor tennis courts available for youth and adult classes, lessons, leagues and rentals. All ages and skill levels are welcome. Available for members, MVP Athletic Club includes an indoor basketball court for free play, pick-up and organized games. Our AWESOME Outdoor Aquatic Center features a Lap Pool with Twisty Slide, Zero-Entry Family Area with Wading Pool, Kid’s Activity Pool, Concessions and Family Picnic Area. What more could you ask for? Not only does our outdoor space include a pool, but we also have basketball, pickleball, sand volleyball and 12 tennis courts! PLUS…we have family lawn games, hammocks and a family picnic & BBQ area with four gas grills! For those cold winter months, MVP Athletic Club offer two outdoor Platform Tennis courts with warming hut. MVP Health Points is our free healthy activity tracking and rewards program. Earn up to $150 easily by checking into the club, classes, training and more! Our team is the best-of-the-best, providing you with a unparalleled level of customer service and knowledge. We are committed to being your partner throughout your health and wellness journey. Want to learn more? From individual to couple, family to golden, we have the membership option just right for you! Complete the form to receive our current membership rates.